*Two black women got into a heated exchange over President Trump and other race related issues while riding on a packed New York subway. Video of the shouting match was posted online Wednesday (Feb. 8). As the train was headed to The Bronx, the women argued for about eight minutes straight about the president, whether black people “started slavery” and the disrespect of Muslims. It appeared that one of the women, who was wearing a blue scarf, confronted the other woman about an earlier incident on the train that was not captured on film. The woman in the scarf accused the other woman of disrespecting a Muslim girl who was apparently on the train. “You want to fight on a train for Donald Trump? It’s a free country, that’s what Donald Trump just taught you. You want to fight with a Muslim? I’m Muslim,’” said the woman in the blue-scarf. Things escalated, and soon a woman in a fur coat jumped in on behalf of Beer Woman, threatening to fight Blue Scarf when they left the subway. That’s when the Beer Woman said the first thing she was going to do was rip off Blue Scarf’s wig. Beer Woman demanded to know what she had against white people before adding that black people started slavery. 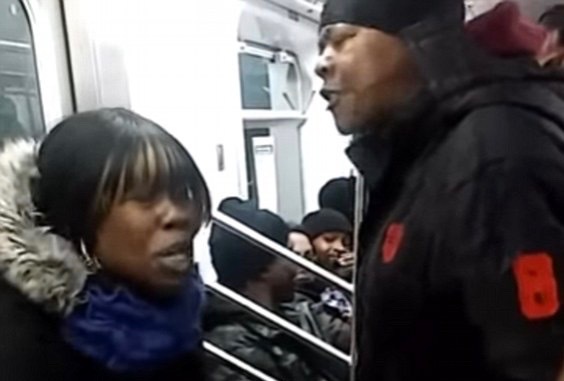 Footage of the pair arguing ended when they got off the train, and fellow passengers cheered their departure.